In the previous post I wrote about the problem of the relationship between the footrests and the brake pedal. Yesterday I rotated the footrest support brackets as described in the 2013 owners manual. As you can see the relationship between the right-hand footrest and the brake pedal (previously adjusted by Alfie Cox Racing to the lowest possible position) is now what it should be. The procedure is relatively straightforward, if a little fiddly when aligning the footrest and footrest spring with the holes in the support bracket so that the pin can be reinserted. It’s a 20 minute job at most (if you have all your tools at hand) and provided no complications arise. In my case there was a complication in the form of a footrest retaining pin that appeared to be out of specification. The first pin popped out with the gentlest of hammer taps (after removing the retaining circlip of course). The second pin however did not have a circlip fitted (the pin did not protrude sufficiently for this to have been possible) and required quite forceful hammer blows to free it from the mounting bracket. It was clear from the state of the head of the pin, that quite forceful hammering had also been applied (without success) in an attempt to get it to seat properly in the first place. 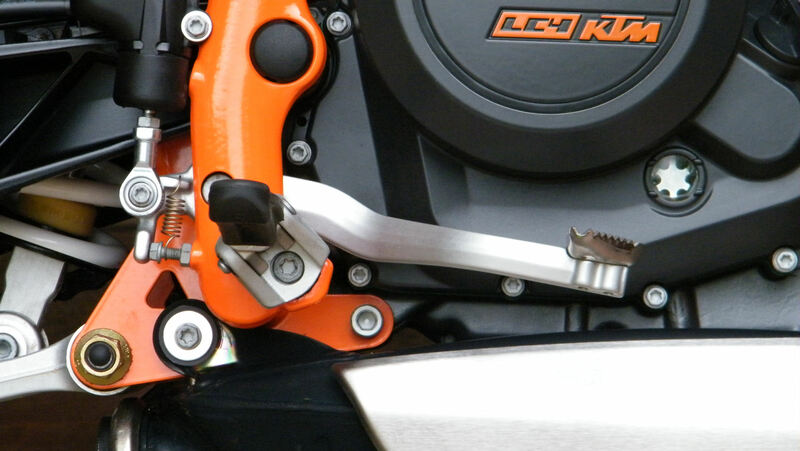 According to the Chassis Spare Parts manual from KTM (see resource page) the pins used for front and rear footrests are the same (part # 60003044000) so I decided to use a pin from one of the rear footrests (previously removed from the bike) to replace the out of specification item. With a rear footrest pin placed next to the pin it was going to replace, it was clear that they were not identical despite what the KTM Spare Parts manual says, but close enough to be used whilst I try to sort out a replacement pin. 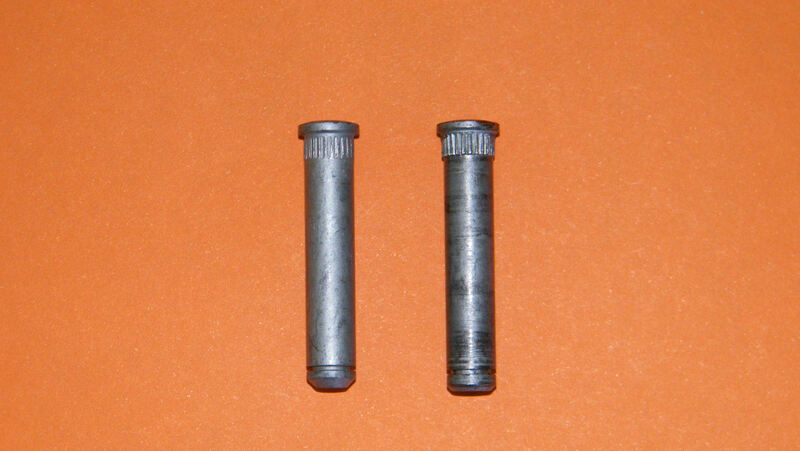 Footrest pin taken from rear footrest at left, original at right.